> Tabletop Shuffleboard Game - Portable Indoor or Outdoor Compact Desktop Pinewood Competition Board Game for Kids and Adults by Hey! Play! 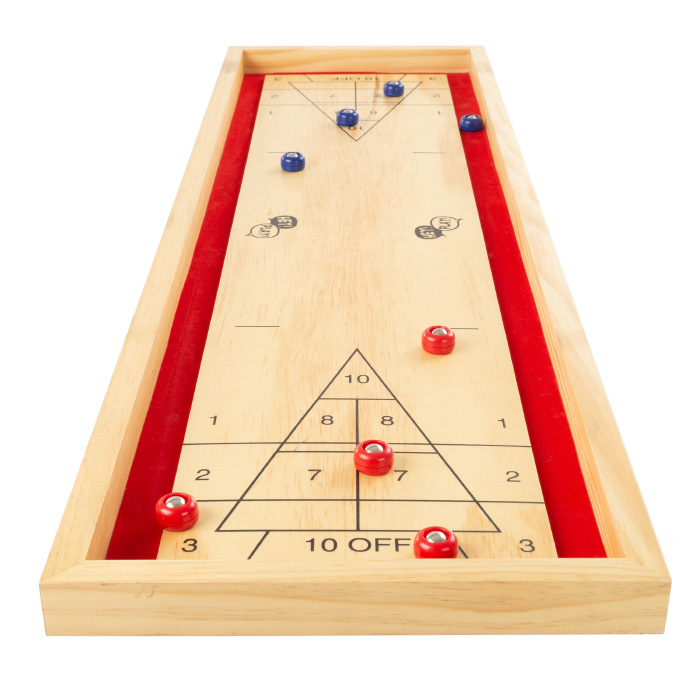 Tabletop Shuffleboard Game - Portable Indoor or Outdoor Compact Desktop Pinewood Competition Board Game for Kids and Adults by Hey! Play! 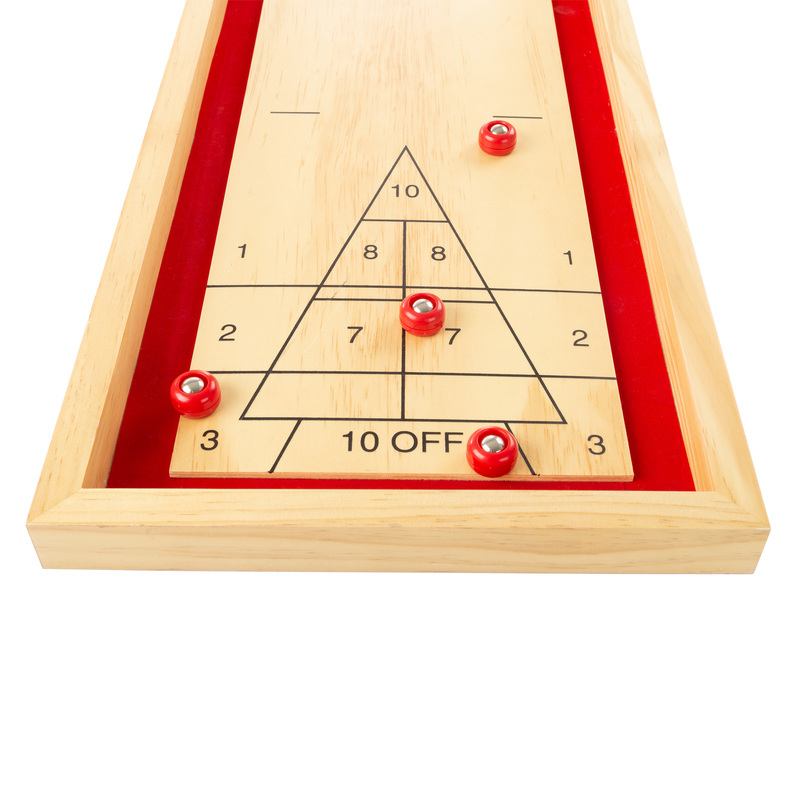 Get ready for old-school fun with friends and family with the Tabletop Shuffleboard Game by Hey! Play! The board is solidly built from pine wood for a lifetime of durability. 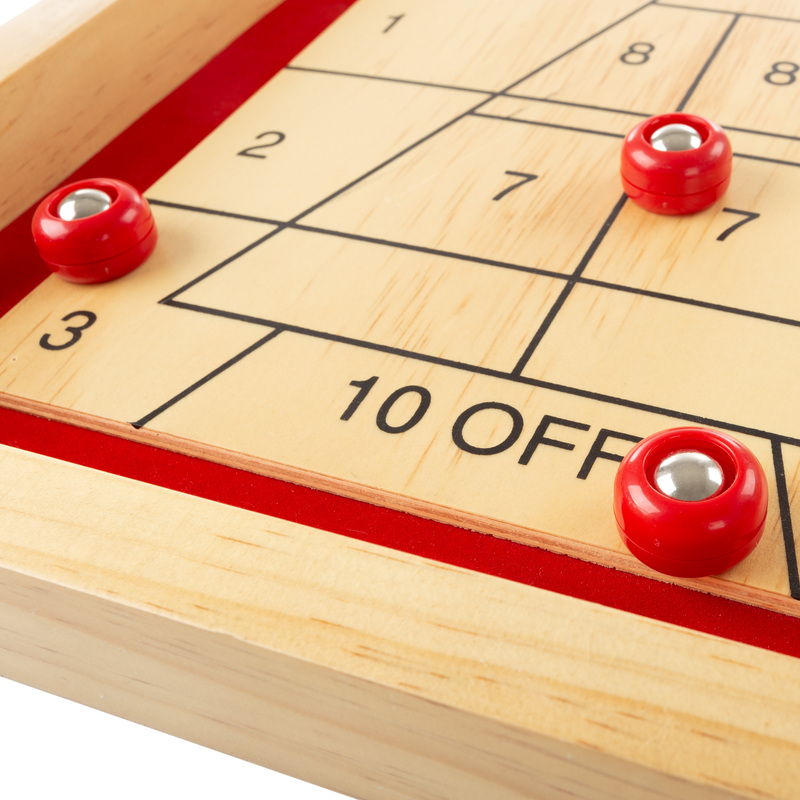 The board is sized perfectly for tabletop play either indoors or outdoors. It’s a great activity for both kids and adults to do on a rainy day inside or on picnics in the park. No sand or wax is needed to make a smooth playing surface since the 8 included pucks (4 red, 4 blue) have rollers. Even though it’s made of sturdy wood, this game set is still portable enough to take to family gatherings or on camping or vacation trips for extra fun in bad weather. The board game provides hours of old-school fun for the whole family while teaching children critical and predictive thinking skills while improving hand-eye coordination and math skills. SOLID CONSTRUCTION- The board itself is built of solid pinewood, ensuring a lifetime of durability and stability. No sand or wax is needed for the playing surface since the included pucks have heavy ball bearing rollers. 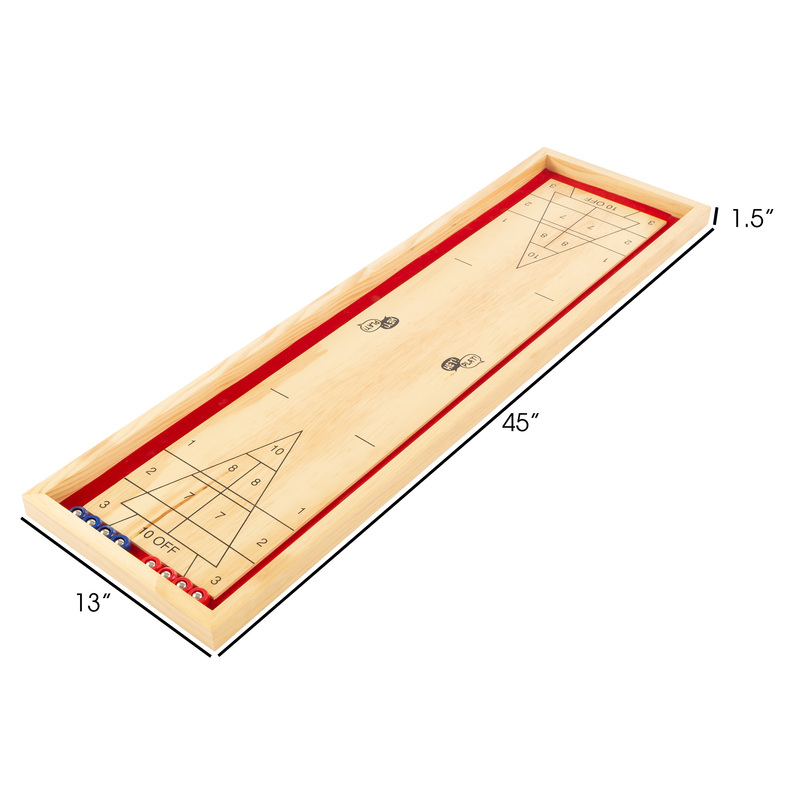 INDOOR AND OUTDOOR PLAY- The board measures 45 inches long, making it the perfect size for family game nights around the dinner table, or playing a quick game on a park bench or picnic table at family reunions or gatherings with friends. FUN FOR ALL- Both children and adults alike will have hours of old school fun with this traditional shuffleboard game. You can start a new tradition of family game night or have an all-inclusive activity for house parties. EDUCATIONAL- Parents will love the fact that this game is not only fun, it will teach their children critical and predictive thinking skills while improving their hand-eye coordination and basic math skills. PRODUCT DETAILS- Materials: Wood, Plastic and Metal. Board Dimentions: 45” L x 13” W x 1.5” H.